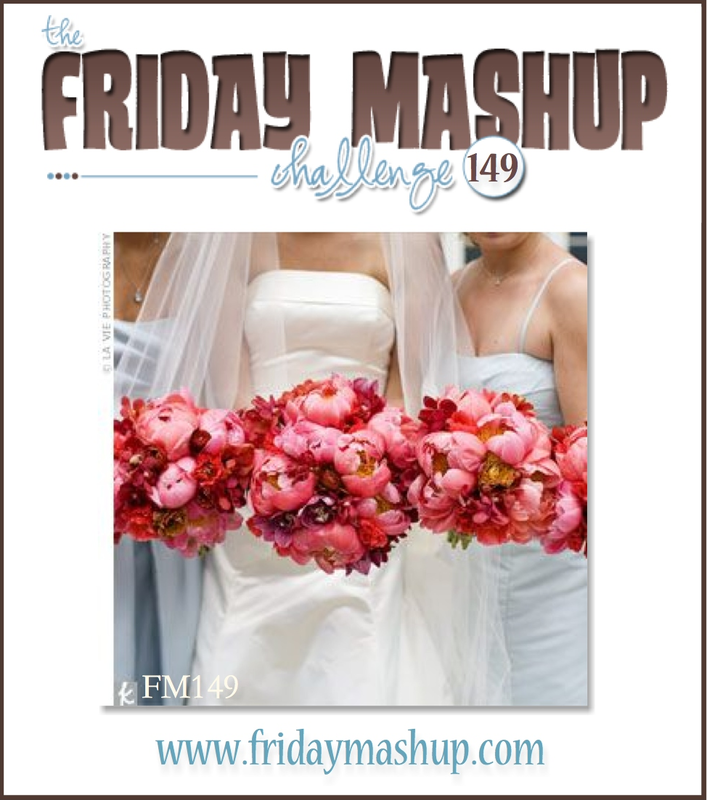 It's Friday and you know what that means...time for another Friday Mashup challenge! This week Cindy is our hostess and just like my title says, she wants to see flowers and a monochromatic scheme! 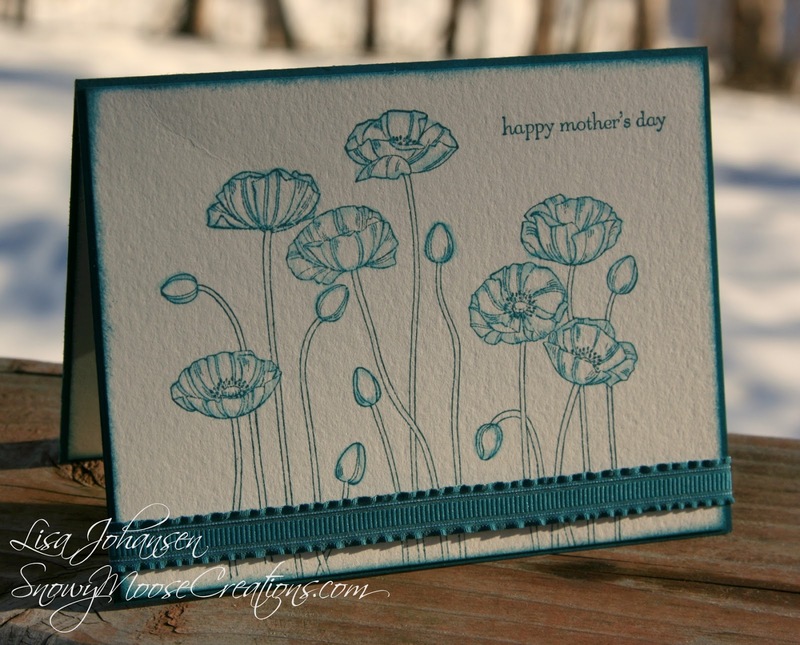 I decided to use the Pleasant Poppies set and I stamped it in Island Indigo on watercolor paper. I took a blender pen and used it on the lines of the flowers to give them a softer look. Then sentiment is from Teeny Tiny Wishes and was also stamped in Island Indigo. Before putting some Island Indigo ribbon around the bottom of the card I sponged the edges of the panel (my daughter was standing there when I started sponging and her comment....oh here we go, mom is sponging again, big shocker....LOL ). Make sure you head over to The Friday Mashup to see all the great projects from the rest of the design team, and then play along with us! Create a project that's "Monochromatic". Create a project with "Flowers". or Create a "Monochromatic project with Flowers". I love, love, love this card Lisa! The flowers in Indigo are gorgeous, especially with the light colouring along the lines. Lisa, what a great color to use for the poppies! LOVE the simplicity of the card- it makes the color all the more vibrant. So, in Pittsburgh- we have had so much snow it is crazy!! I guess it's not as north as Alaska. lol..(now, I am singing...North to Alaska). I just got to FLA for a few weeks, and PA is under snow attack again! Mr. Bee has to be in NY for business and is not happy! I do wish we could send you the snow, Lisa! What a lovely card! Very simple and elegant! Nice showcase of this color too. Lisa, I loved the way you used this stamp set. I think one layer cards are hard and you did a terrific job with it. Love it!! Ack, this stamp set keeps popping up, and I don't own it! I love the simplicity of this, and the texture of the watercolor paper is fabulous! Love love LOVE! The CAS design, the blue poppies, the textures... it's all so elegant. Absolutely gorgeous!